Note: Plugins created by this method are perfect for sending input from user (e.g. control an output pin) and are just fine for non frequent readings (e.g reading temperature sensor every 10 seconds). In case you need an EVENT driven plugin (button pressed, accelerometer, gyro, ... ) you may want to have a look also at different methods (e.g. socket.io and node.js). In this step, we are going to create a simple plugin which can be activated through WordPress plugins menu and will be visible in our WordPress Admin panel. 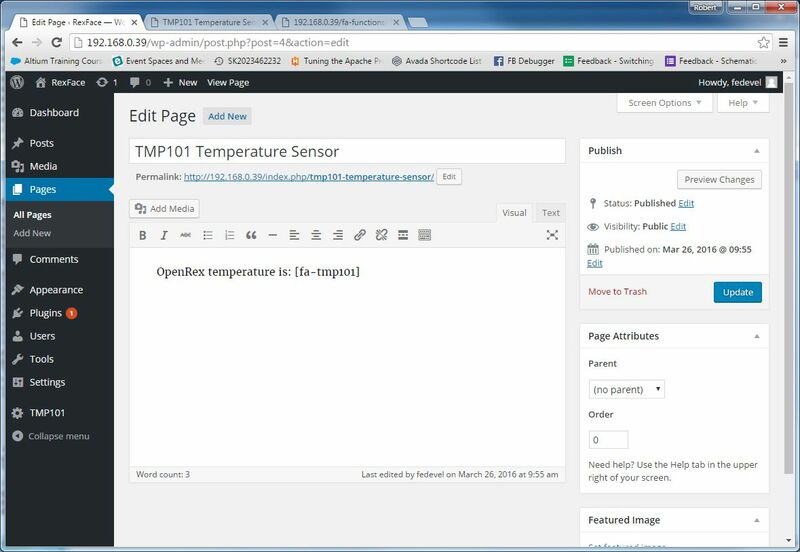 Let's create a "TMP101 Setting page" which will be visible under Administrator panel. 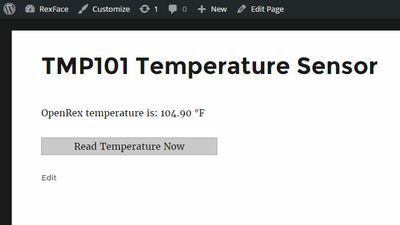 Later we will use it to specify a default interval for reading the temperature (e.g. read temperature every 10s / 1 minute / 10 minutes). Now, activate and check if you can see your new plugin correctly. We are going to create a "[shortcode]". 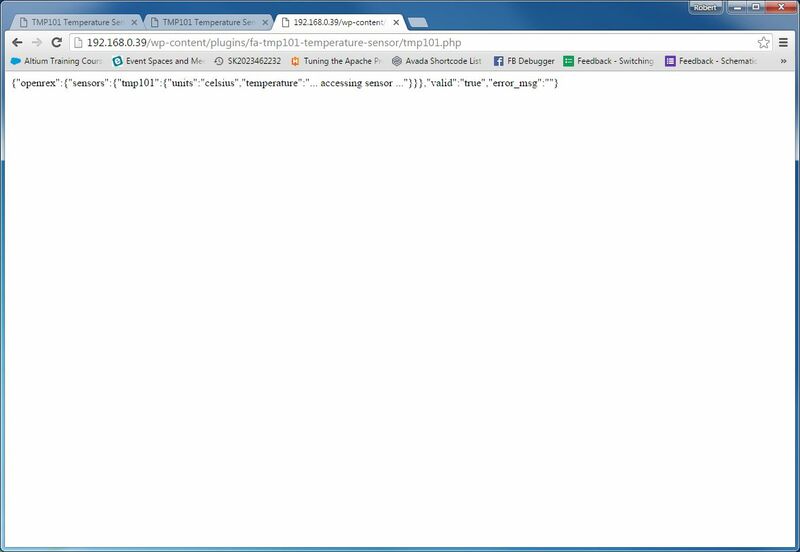 This [shortcode] can be then used anywhere on your Pages and will be replaced by the actual temperature. In your WordPress Admin menu, click on "Pages" and then "Add New". 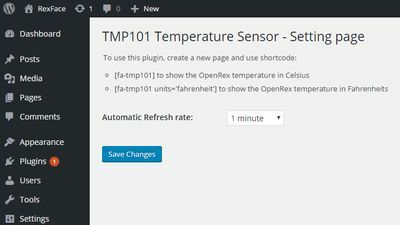 Enter title: "TMP101 Temperature Sensor" and use following text "OpenRex temperature is: [fa-tmp101]". Then press "Publish" button. 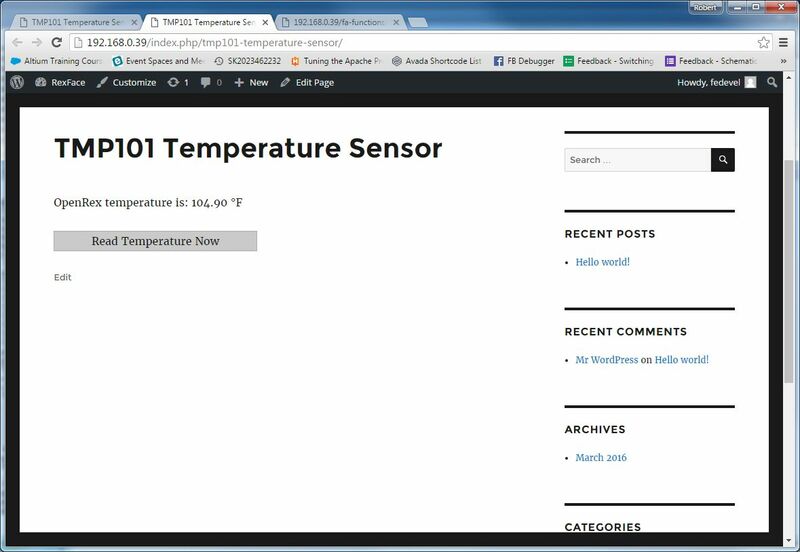 This is how it will look: Go on your TMP101 Temperature Sensor page. 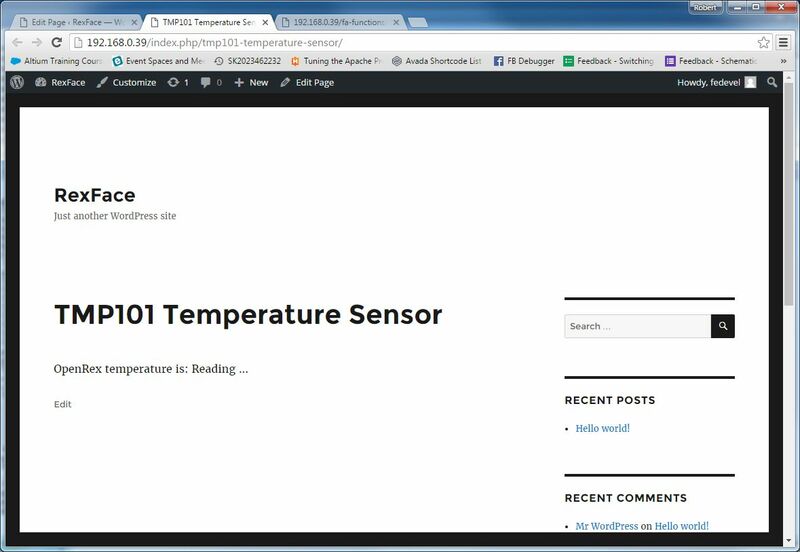 The page url will look something like: "http://192.168.0.39/index.php/tmp101-temperature-sensor/" and the page itself will look like this (notice, the shortcode [fa-tmp101] is replaced by text "Reading ..."): Perfect, the shortcode is working, "only" what we have to do now is update its content. Follow the next steps. To be able to run an application from website, you need to set proper permissions. By default, it's disabled due security reasons (so not everyone can run Linux commands on your board). 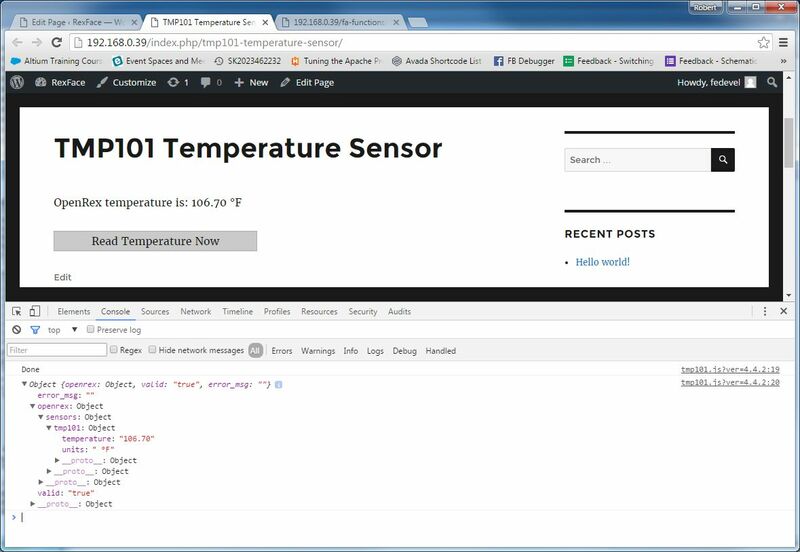 One way how to enable "web" to run i2cget (the command which we use to read the temperature sensor) is to add exceptions through "visudo". In our case, the web user is called "daemon". //[fa-tmp101] shortcode. 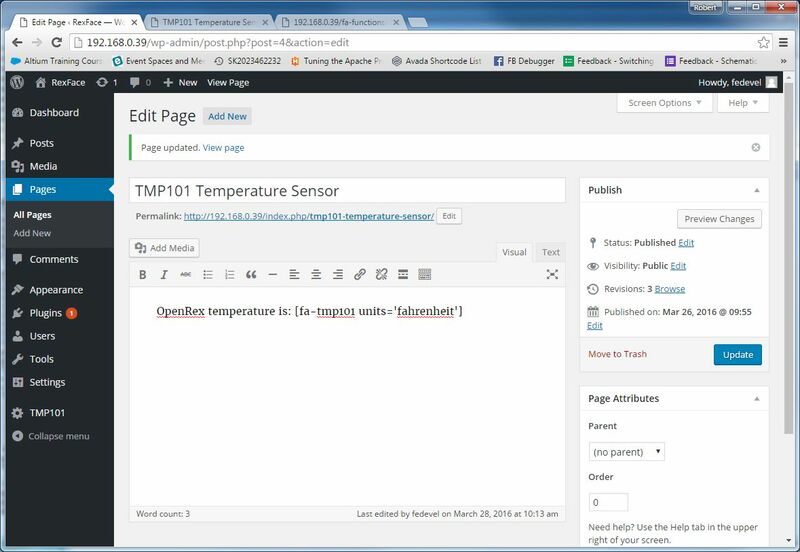 It will read and show the value of TMP101 OpenRex sensor. We will be editing our main fa-tmp101-temperature-sensor.php plugin file. //you can set refresh rate in admin panel. this will help us to create refresh_rate "variable"
Now, go to your TMP Temperature Sensor page and refresh it (F5). Every 1 minute you should see the reading. 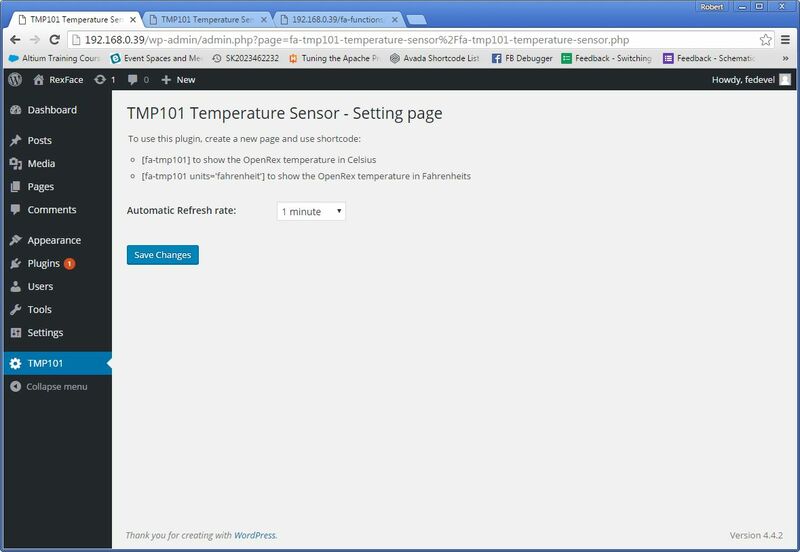 It will look like this: If you would like to change the refresh rate, just go to your TMP101 Temperature Sensor Settings, change the refresh rate and press "Save Changes" button. 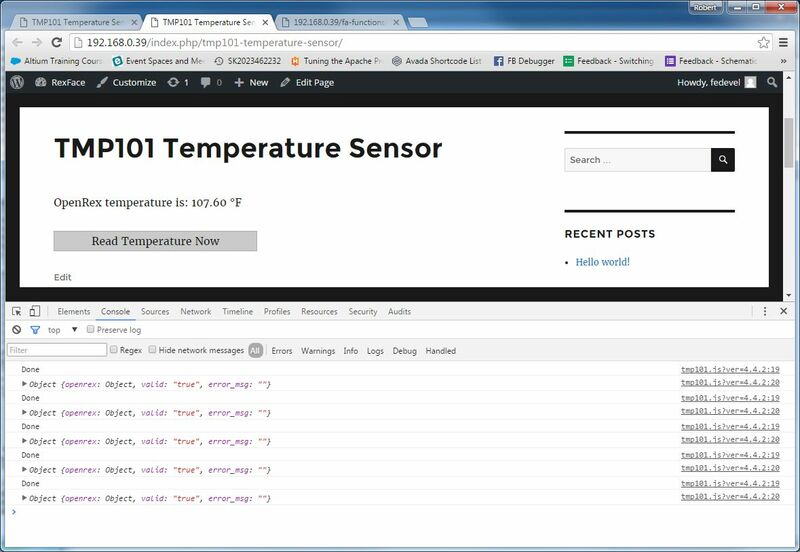 Go back to "TMP101 Temperature Sensor" page and refresh it. In case you would like to share your plugin, you can simply upload it to Github. This is how you can do it. 1) Go to your Gihub and create a new repository.